The world may need more propylene oxide (PO) capacity three or four years from now, but Lyondell is under no obligation to fall on its sword and be the volunteer to build. While this business may have adequate returns for LYB based on the assets on the books today, it does not create an adequate return based on current replacement value – Exhibit 1. This analysis of course assumes that others in PO doe not decide to build at the same time – a pattern for the chemical industry (Dow has already announced investment in PO) such that profitability by the time the new LYB plant starts up is lower than the last three years. It is noteworthy that as the 2017 wave of ethylene capacity starts up we are in a period of spot ethylene margins that do not come close to covering depreciation on the new facilities – let alone generating a positive return on capital. This is the norm for the chemical industry, not the exception, and we have written extensively on ethylene about the difficulty with making adequate returns at any point in history. PO and other larger capital expense based products are no different and it has been more than a decade since anyone made sustained reinvestment margins in PO and its derivatives. The polyurethane market is, in general, on an upward trend, albeit slow, though not for all ingredients. It has been a slight positive for HUN, Covestro, BASF, DOW and others, but as the economics below show, it is far from profitable enough to warrant reinvestment. If there was real confidence in the space, Bayer would have been able to sell Covestro rather than spin it out and someone would have made a bid to buy Huntsman. Investors do not own LYB for its PO business – they own it for the ethylene leverage and the increasing leverage to the cycle as the company buys back stock. We would much rather see LYB participate in a consolidating acquisition in ethylene – at values below replacement cost than build anything new. We have discussed this in recent research and have suggested that both WLK and Braskem would be interesting targets for LYB. We do not think that there is a possible deal with Dow Material Science – as some are hoping – and this additional PO capacity as well as Dow’s talk about investment would be major red flags for the regulators. We like the ethylene cycle and we like the valuations for both LYB and WLK, while recognizing that we may not get any ethylene momentum before 2018. 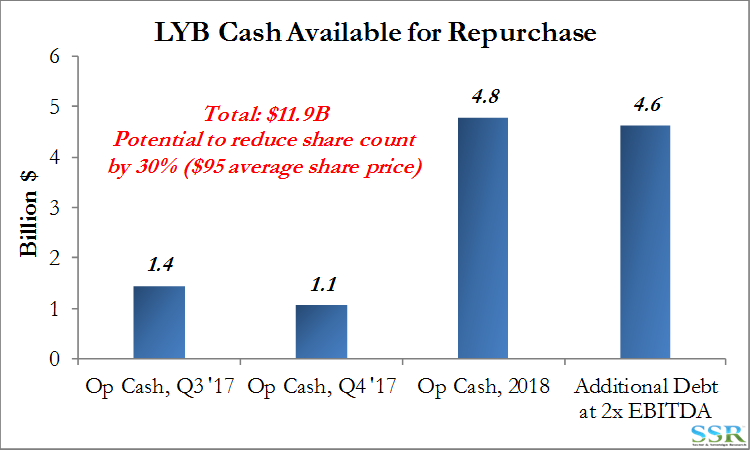 We would rather have seen a larger buyback from LYB than this investment. On the margin we would now focus more on Westlake as a way to play the improving ethylene cycle – with possible upside of some momentum in the chlorine chain while you wait. Dow is more highly valued and is discounting much of the deal synergies of the DuPont deal – however, Dow will likely appreciate meaningfully with more confidence in ethylene. As big supporters of the Lyondell longer-term story we are disappointed with the decision this week to spend almost $2.5 billion on a new PO/TAME complex at Channelview, Texas. Lyondell has been the winner in the capital allocation game for the last 4 years focusing on returning cash to shareholders rather than chasing expensive capital projects in the US or paying up for acquisitions. While the stock has not performed well over the last two years, it has had nothing to do with the strategy and everything to do with the ethylene market uncertainty that we see today and the fluctuations in energy prices. Lyondell’s valuation peak coincided with a spike in crude oil prices, relative to natural gas, and the peak margins that created for ethylene – at the time the company decided that the best capital allocation was the repurchase of shares and a higher dividend. Lyondell has purchased 25% of its outstanding share base over the last 4 years and is by far the most levered play to an ethylene business that is not in bad shape today and will likely get better quickly post 2018, barring a complete collapse in oil pricing. We estimate that without this project and with some escalation in borrowing, LYB could repurchase another 25% of current outstanding shares by early 2019. Given the very poor track record that the industry has in getting adequate returns on any new capital investment, we would much rather see Lyondell pursue consolidating acquisitions than build something new. Note that as Dow Chemical starts its new ethylene facility in Freeport, Texas we have spot ethylene margins in the US that are less than a third of what they need to be to generate adequate returns on that investment and likely less than 20% of what they were when the decision to build was made – Exhibit 2 (the green line is an estimate of where margins need to be to generate a 12% return on investment). The PO and polyurethane market is not short of product and the market is not generating enough margin to justify reinvestment today. The business is on a slow improving trend, something that LYB, HUN, BASF, Covestro and DOW have been waiting for years, but growth is slow and while the global market probably does need a new facility by 2022, there are no guarantees that any new facility will make adequate returns. The logic that “we have to build first or others will” is not justification to throw a lot of shareholder capital after a project that is unlikely to make adequate returns. It is an argument that we heard in the up-cycles of the late 80s and mid 90s in the West – it did not stop others building and we cannot point to a single project in the US or Europe that was accretive, in any large scale chemical. 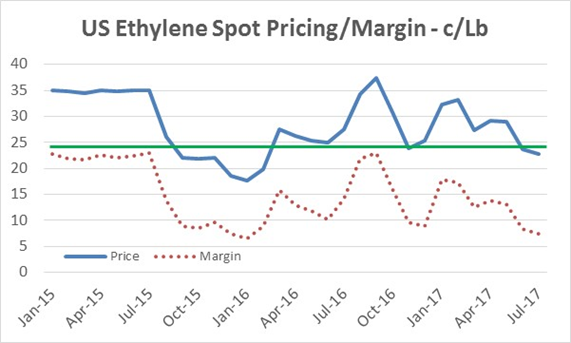 Without a quick recovery in pricing and margins, these new ethylene projects in the US will struggle to get a positive NPV. Dow has already announced a capital program to improve its PO business in the US, and we doubt that this will come without either higher capacity or improved run-time. Separately, LYB does not have a technology moat around the business wide enough to guarantee a decent return, whatever the point in the cycle. Based on the announced costs we estimate that LYB’s current intermediates business has a replacement value of more than $11bn and the published operating earnings numbers would suggest that the company only made a 7.1% return on this replacement value today in 2016, down from just over 8% in 2014 and 2015. In summary, this is a bad decision, in our view. Better to let the PO and TAME markets tighten – generating higher margins – and use the cash flow either to buy back stock or pick off consolidating acquisitions in ethylene. Anyone holding their breath for some sort of LYB/Dow Material Science combination should note that the companies already have 90% of the North American PO capacity and more that 50% of the European PO capacity on a combined basis – which would not be approved by either regulator. LYB remains the most levered to an ethylene story that we think will be better than the current consensus view – it is therefore hard not to recommend the stock, even if we think this recent move is a poor use of capital. In LYB’s April analyst day, when the unpopular idea of an acquisition was raised, the company gave enough information to make an estimate of the replacement value of many of its businesses and at the time we wrote about the discount in LYB’s stock relative to its replacement value – focusing on the ethylene chain and highlighting that not only were companies building ethylene and polyethylene, therefore validating that replacement cost was an appropriate measure of valuation, but that Nova had paid more than replacement cost for the Williams assets – providing further validation. The updated table is included in Exhibit 3. In the table we have updated the “Market High” valuation for a couple of reasons – raising ethylene, polyethylene and polypropylene in the US because new plants continue to make the headlines – but also because it shows whet is priced into the stock today with respect to replacement value as the current price is effectively at the “Market High” level. Upside in the stock will come from either greater leverage to ethylene – i.e. more buy back – or from a recovery in the ethylene cycle and a return to above average ethylene margins. If you contrast this with WLK – Exhibit 4 – there is much more upside at WLK simply based on replacement value. This is why we think that WLK remains an interesting acquisition target as well as a value play on the ethylene cycle. LYB would want at least a 30% premium from a buyer and today that would place the value well above replacement cost. While buying LYB might be a possible strategy for Shell or Aramco in the medium term, we think the odds are higher that WLK gets involved in a consolidation move than LYB. 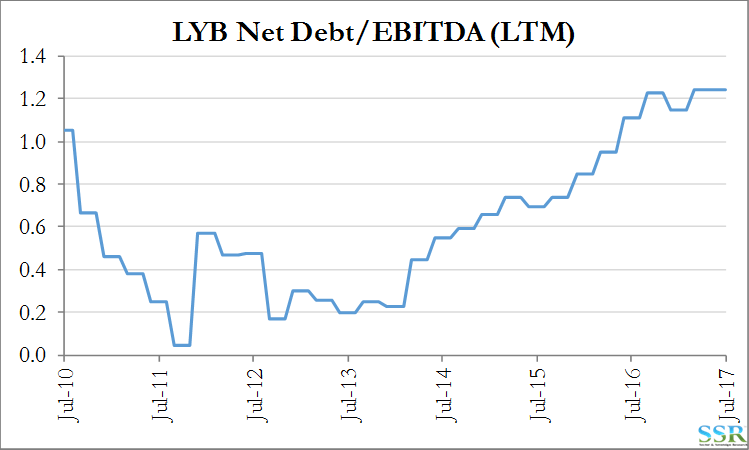 LYB still has relatively low levels of net debt, and has talked in the past about keeping its powder dry for acquisitions – something the market took very poorly but we saw much less negatively, depending on the deal. While net debt has risen relative to EBITDA over the last few years – in part to pay for well-timed ethylene expansions at the right price – Exhibit 5 – the company has plenty of borrowing capacity. If free cash for the balance of this year and expected free cash for 2018 was directed to buybacks and the company raised its debt level to 2x EBITDA, we estimate that a buyback could reduce the current share count by another 30% – so roughly 100 million shares – at $95 per share – Exhibit 6. This would give LYB roughly 55 pounds of ethylene per share, with a 20 cent upswing in ethylene margins driving more than $10 per share in EBITDA gain. 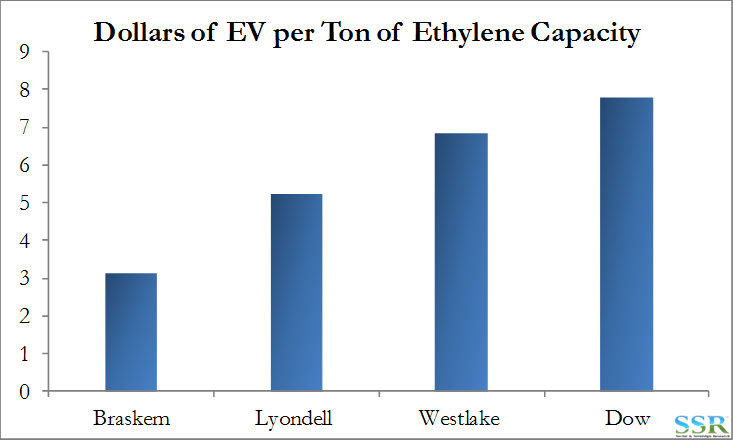 Today, the only cheaper source of ethylene capacity that we can find in a publicly traded company that might be of interest to LYB is Braskem – Exhibit 8. Despite its replacement value discount, WLK does not look cheaper than LYB on this basis because you are buying much more than ethylene – with all the chlorine/PVC assets.